Building your best health, one bite at a time! Practical nutrition advice for your busy life! Canada has a new food guide (which I will refer to from now on as the CFG) and people are either loving or hating it! I’ve had many people ask questions about this new document and so I will do my best to answer as many of them as possible! Don’t forget that this is only phase one of a two-phase release of the suite of tools which will be made available on the CFG. Let’s all take a deep breath and wait for Health Canada to release everything before we get our knickers in a knot! Please remember that these are my/our opinions and do not reflect the opinions of our profession of registered dietitians as a whole. Also, it is important to note that dietitians do not write the CFG - we are one of many stakeholders who contribute but do not write the final product, nor are we mandated to preach it either. Does Canada even need a food guide? Since Health Canada announced that it would be updating the 12-year-old CFG, a debate has sparked around the relevancy of having a food guide in such a culturally diverse country like Canada. That’s a fair question. It is intended to help you choose foods that improve your health, meet nutrient requirements and reduce your risk of nutrition-related diseases. Overall, it’s a GENERAL tool for the GENERAL population. Not a SPECIFIC tool for your SPECIFIC lifestyle or health concern. Let me state that again, it is trying to take into consideration the needs of 36 million Canadians and with a few simple pictures and words, summarize what *most*of us should be doing. It’s kinda tricky. That’s an understatement. Without knowing it, you may be impacted daily by the recommendations in the CFG since it is used in the development of school curriculum, the development of menus at licenced daycares, correctional facilities, hospitals etc. P.S. If you’re a history buff, be sure to click here and read more about the progression of the CFG overtime which first debuted back in July of 1942 during war rationing times! If anything, you’ll have a few good laughs! What’s new about the 2019 version of Canada’s Food Guide? Here are a few key changes and my opinion on these changes too. 1. Digital transformation. This food guide has been digitized and is available in a mobile-friendly web application. There exists the option to print a pdf copy but I don’t believe you can order print copies directly (unless that is scheduled for phase two of the release?). IMO: This is a giant step in the right direction since most of us are married to our phones or the internet. My hope is also that as research and evidence shifts over time that the document can be easily updated. This online version also allows you to learn more about each aspect of the CFG by clicking on subheadings and gaining practical suggestions to help implement a specific dietary change(s). 2. The food and beverage industry was not sitting at the table this time. Health Canada specifically stated that they did not meet with industry reps; however, the online public consultations were open to all stakeholders, including industry. (Read more here). In the development of the last CFG back in 2007, about one quarter of the advisory committee consisted of corporations who would benefit from their foods being highlighted in the CFG. IMO: Yes! Yes! Yes! I know this might pain my dairy-farmer, egg-farmer and beef-farmer friends but please don’t hate me! A national health tool needs to look at the evidence without the influence of industry and companies who exist to maximize their bottom line, not the health of Canadians. Don’t think I’m a fool though – I am completely aware that industry and big companies feed my family and I, but with chronic health conditions plaguing our society at all-time high levels, we need to look at the situation with as little external influence as possible. One might argue that the scientific evidence has already been altered, as studies are often funded by industry, but at least Health Canada is trying. Had the beverage industry been at the table, the drink of choice would have been pop. Just sayin’. 3. Water is in as the choice beverage. To follow up on the note above, water is the recommended beverage and if you click further on the online document, you will read that other healthy options are suggested including unsweetened teas, coffees, white milk, and unsweetened fortified plant-beverages. IMO: Hooray! The picture of the glass of juice on the last version of the CFG was not supported by evidence. I hope/expect that phase two of the CFG release will include more specific recommendations around beverages, especially for infants and children. However, the guidelines for feeding healthy term infants (6 months to two years) are still relevant and applicable which recommend 2-3 cups of cow’s milk daily for children, in addition to water. Canada’s New Food Guide - Make water your drink of choice. 4. Picture-oriented plate model & no more food groups. Isn’t there a famous saying that “a picture is worth a thousand words?” The dissolution of the four food groups (i.e. remember the rainbow… fruits/veggies, grains, meat/alternatives and milk/alternatives) into a more comprehendible picture is a big shift with the new CFG. The grouping of food appears to be primarily based on micro and macronutrients. IMO: Well done. This pictorial representation, using real food instead of cartoon drawings, will hopefully be easier for everyone to follow, regardless of language or literacy. Just an FYI that this plate method is not a new invention by Health Canada! If you have ever heard of the Just the Basics tool for diabetics or the Harvard Healthy Eating Plate, this is Canada’s version. This idea has been around for years, we’ve just jumped on the bandwagon now. 5. No more ‘Food Guide Servings’. Instead of seeing specific servings of foods that we should eat, the recommendation is to look at proportions of food on our plate with 1/2 plate full of fruits/veggies, 1/4 each for protein-rich foods and whole grain foods. IMO: Thank goodness! Those confusing “Food Guide Servings” are gone. Who actually used that on the daily to portion their food? The servings were quite confusing and way too high (or low) in certain circumstances. I have used the plate model to discuss eating patterns with my clients, if applicable, and find this to be much more user-friendly than explaining specific servings. Phase two of the CFG release does indicate that there will be more guidance for specific amounts and types of food for various life stages. 6. Includes advice on HOW to eat too. This is brand new and a first for the CFG. 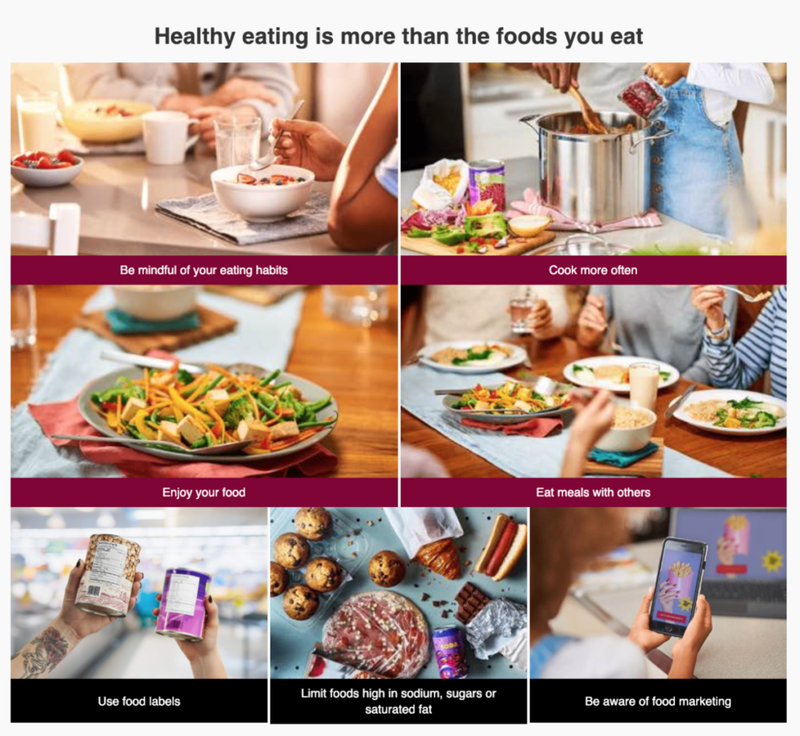 On the 2019 version we see the importance that healthy eating extends beyond the foods that we eat and includes aspects like mindful eating, cooking more often, enjoying food, eating meals with others, and being aware of how food is marketed. IMO: Fantastic! I am so glad that Health Canada acknowledged that food is more than just calories. One cannot fully understand the complexities of nutrition without considering the social aspects of food and how they play a role in our consumption. Bringing attention to the role of marketing in our food choices, as well as encouraging us to cook more often, are messages that need to be communicated regularly. Canada’s New Food Guide goes beyond food and looks at how we eat, not just what we eat. What would you change about the new Food Guide? I’m glad you asked! After reading through the documentation, there are a few questions that are still left floating around in my mind. Questionable grouping of food on the plate. I have nothing against potatoes whatsoever, but nutrient-wise, they are not synonymous to spinach or tomatoes, so I am not sure why they are considered a vegetable. I would not recommend that the general population fill half their plate with potatoes or other starchier vegetables, in addition to a quarter plate of whole grains. Potatoes belong in the “whole grain” group, which is essentially a group focusing on higher fibre complex carbohydrates. This also ties into my confusion around the advice to “fill your plate half full of vegetables and fruit” which misses the evidence that more of the “half-plate” should be filled with vegetables than fruit. Again, there is nothing wrong with fruit but with a higher sugar content in general it could have been noted somewhere to focus more on veggies. This is distinguished in the Harvard Healthy Eating Plate and other similar tools. Perhaps there is evidence to show that Canadians simply need to eat more fresh produce period!? Lastly, where do avocados fit? Their fat content doesn’t really make them a vegetable. (Ahem … and healthy fats are missing in general!). Also, not all of those protein-rich foods are created equally. You will get vastly different amounts of protein from a quarter plate full of walnuts vs. a quarter plate of chicken. All fresh foods. All whole foods. No processed foods. No salt. No sugar. Instagram-approved. While that seemingly would appear to be ideal, it’s not realistic. Most of us don't live under a rock and special/treat foods are not going anywhere anytime soon. I think it might have been reasonable to include a small amount of foods that you would eat occasionally, which would have better demonstrated the concept of enjoying food and mindful eating, as is highlighted in the CFG document. Additionally, there is nothing wrong with many frozen or low-sodium canned veggies and frozen or no-added sugar canned fruit. Adding pictures of these on the plate would have been more inclusive to those who cannot always afford to buy fresh (aka - my family and many others!). If you read the supplemental material, the guidelines do mention that canned/frozen are good options, but I still think that including an example in the main picture would have spoken to a larger audience. I was a bit dismayed at the fact that the foods shown on the plate are not fully representative of our ethnically diverse population that makes up the ‘mosaic’ of Canada. No dragon fruit or bok choy, miso or curry, chapati or sushi. Including some of these foods would have been helpful to reach a larger audience. There is essentially no mention of snacks on the new CFG. This is a problem since we know from the Canadian Community Health Survey Cycle 2.2 that Canadian’s are big snackers. Data from this analysis shows that the number of calories derived from snacking was comparable to the total calories eaten from main meals and was highest among young children and adolescents and consumption of added sugars is highest at snacks. Some space devoted to the topic of snacks, especially for young children (my bias of course!) is desperately needed! I haven’t since I graduated from University. I had a few big beefs with the last one, which stated that a ½ cup of apple juice was the same as eating a whole apple (nope – wrong!) and to aim for half your grains to be whole grains (why not ALL?!). Sigh. That’s only two of many rants I could go on. However, I may start using this new one when requested to talk in schools since it is part of the school curriculum and will be familiar to children already and I can expand on the topics. People come to see a registered dietitian because we give individualized counselling based on scientific evidence. Clients don’t pay me to tell them to google the CFG. 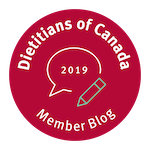 Registered dietitians are legally required to stay on top of the most recent evidence and a food guide is a tool that cannot do that in the same capacity. However, having just said that, some people may need a more general tool or might find this to be the most helpful starting place for them. And that’s fine too. It’s about finding what works best for each client, and that can take time. “CFG is a lot like pants. There are all types – slim fit, cropped, khakis. Problem is, the government has to design pants to meet the needs of 36.7 million Canadians. That’s a big ask. Have you seen one-size-fits-all pants? So Canada put out a general format for pants: must have a waist, zipper and two legs. But some people aren’t happy with this. “These aren’t (keto, low-carb, organic pants)”, they say. There are two options when pants don’t fit. You can mope, let them drag, slip down, pull em up, cry out “All pants are useless!”. Or, see a tailor/seamstress to have them fitted to your body. If you’re upset the CFG doesn’t “fit” you, what you really need is a dietitian to tailor it. It’s true, some people can’t afford “pants”. Over 4 million Canadians are food insecure. This is on you (Government of Canada). Adjust policies to make it easier for people to access and feed themselves healthy food. Look at the social determinants of health. Policy needs to match science. What are your thoughts on the new CFG? Please leave a comment below so that everyone can engage in a healthy and respectful conversation. We look forward to hearing from you! If you enjoy the simplicity of booking your own appointments online as much as we do, you will enjoy our NEW online booking feature. Click below and get started! Want a copy of the tool that keeps my family eating well all week long? Subscribe to our monthly newsletters and receive a FREE weekly meal planning template. No lifetime commitment needed here folks. You can unsubscribe anytime! Please click here to read our disclaimer, disclosure, and copyright statement.